A new country in Africa? We might see the birth of a new country soon! Elections are being held in the southern part of Sudan to decide if Southern Sudan should become a separate country. The elections started on January 9, and will last one week. Only the citizens of Southern Sudan get to vote to decide if they want a new country. If they vote for separation, a new country will be created on July 9, 2011. To understand why folks living in the southern part of Sudan might want a separate country, we need to take a step back in history. Sudan is the biggest country in Africa, and is almost ten times the size of the United Kingdom! Sudan got its independence from the United Kingdom in 1956. In its 55 years of freedom, it has only had 12 years without a war. Northern Sudan is mostly a desert while Southern Sudan is green. Southern Sudan also has oil, which brings the country money. Sudan is a land with many religions and ethnic groups. The people in the South are mainly black Africans, many of whom are Christians. The majority of people in the North are Arabs of the Islamic faith. For a while, the government was dominated by the people from the North, and more money was invested by the government in improving living standards in the North as compared to the South. People in the southern part of the country felt they were not being treated fairly. Also, the government tried to impose Islamic law in the whole of Sudan. The people living in the South rebelled and a war broke out that lasted for over 20 years and killed more than 1 million people. This war came to an end in 2005 and the South was given some amount of self-governing. It was also decided that people from Southern Sudan will be given an opportunity in 2011 to choose whether they want a separate country. Over 75% of people in the South can’t read and write. The ballot forms that are being used for these elections have been simplified so people who can’t read can still easily vote. 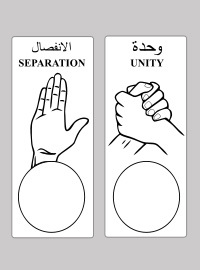 On the ballot forms, there is a picture of a single hand meaning “a separate country”, and there is a picture of two hands shaking, meaning “one Sudan”. Sudan’s capital is Khartoum, and Southern Sudan also has a capital called Juba. The Nile, one of the world’s longest rivers, flows through the country. Sudan is the world’s single largest producer of gum arabic (also known as gum acacia) – it is used in sweets such as M&Ms.